Police say they are looking into possible new leads in the unsolved killing of a teenage girl 60 years ago. 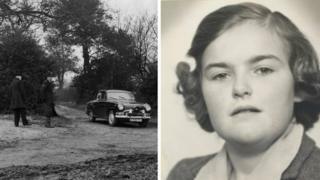 Anne Noblett, 17, was found dead in woodland near Whitwell, Hertfordshire, on 31 January 1958, 32 days after she went missing. Detectives have reviewed the case a number of times but have been unable to identify her killer. Hertfordshire Police said six people had responded to an anniversary appeal with potential information. The 'Deep Freeze' murder: Who killed Anne Noblett? "Inquiries are ongoing to fully explore the information they have to share," a spokesman said. Anne disappeared while returning home to Marshalls Heath Lane in Wheathampstead after attending a dance class in Harpenden. She had taken a bus home and got off at Cherry Tree Corner. This was the last time she was seen alive and it is believed she was murdered within hours of her disappearance. The cause of her death was strangulation and it is thought Anne's body was stored before being moved to dense woodland in Rose Grove Woods, known locally as Young's Wood in Horn Hill. Due to the condition of the body when it was found, it was considered she may have been held in cold storage for some time. It led to the press dubbing her killing the Deep Freeze murder. Her family remains desperate to understand what happened to her, police said. The case has been reviewed several times, including as recently as February last year. Mick Flavin, of the Bedfordshire, Cambridgeshire and Hertfordshire case review team, has admitted there is a good chance Anne's killer might be dead. "Six decades later, we are appealing for anyone who may have information but may not have felt that they could come to police earlier to please get in touch," he said.